A saltern site of three mounds seen in the geophysical results. Pottery and charcoal have a very high magnetic field compared to the surrounding soil causing the mounds to stand out against the background. 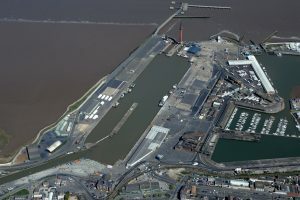 Traditional methods of salt production along the Lincolnshire coast line is known to date back to as early as the Bronze Age (c.2500 BC) and continued right through until the industrial revolution. The method for salt extraction was fairly simple and involved the trapping of sea water from the high spring tides into channels and artificial lagoons or ponds. Here the sea water was allowed to slowly evaporate until a salt rich brine was left. At this stage the brine was transferred to vessels made of poorly fired clay which were heated over fires to evaporate the last of the water. These cheap clay vessels, known as briquetage, were discarded in great quantities into large mounds of waste product. It is these mounds, called salterns (pictured), which are formed of broken pottery and charcoal that serve as the most visible marker of where salt production has taken place. 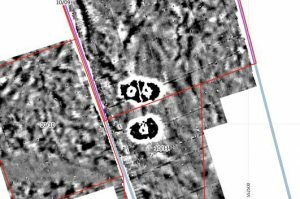 A number of these features were discovered in the trial trenches and were especially visible on the geophysical results. Preliminary assessment suggests most of those discovered date to the Iron Age or Roman periods. Due to fluctuations in environmental factors many of these mounds are further inland now than they would have been at the time. 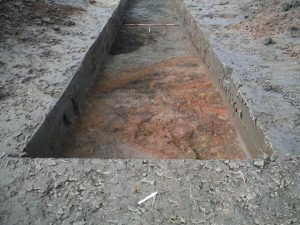 The top of a saltern mound seen in one of the trial trenches. The red and orange deposit is formed of the broken pottery vessels and remains of the fires used to heat them.